What Jesus says here about Himself is tremendously hope-filled. “Compassion” has to do with feeling deeply with another person. It has to do with taking on their sorrow or pain, and feeling it with them. No other religion in the world describes God as taking on people’s sorrow or pain, and feeling it along with us. But Jesus describes Himself as having compassion. He noticed the hunger of the people and felt for them. I find great hope in knowing that I am not left alone in my pain or sorrow. I find great hope in knowing that God cares enough for me to feel my hurts and needs with me. I find great hope in a Savior who feels our pain with us. Gratitude and hope, those are fitting responses to meeting the God who has compassion toward us. But what Jesus says in Matthew 15:32 about Himself also challenges me. Why does the compassion of Jesus challenge me? Because I am called to imitate Him. If Jesus has such compassion for others, then I am to have compassion toward others as well. If Jesus felt with people in their pain and sorrow, then I am to feel with others in their hurt and need as well. If I am to live like Jesus, then I cannot turn my back on others or turn a deaf ear to their cries. The compassion of Jesus calls me away from my self-centered living. It calls me away from apathy. It calls me away from judgmentalness. Fyodor Dostoyevsky once commented, “To love someone means to see him as God intended him.” That’s what Jesus did over and over again in His dealings with people. It’s what He calls us to seek to do over and over again in our dealings with people. Therefore, I find great challenge in the compassion of Jesus. WHY DON’T I HONOR THE SABBATH? Why did God command His people to set aside a day for Sabbath? This command had no precedent in the cultures that surrounded ancient Israel. No other people of that time had any such practice of dropping all work for one day and setting the day aside as a day of worship and rest and family togetherness. So why did God command it? More personally…why should I honor the Sabbath? Intellectually I understand the value of Sabbath. I understand the importance of rest. Leonardo da Vinci points out, “Every now and then go away—even briefly, for when you come back to your work your judgment will be surer; since to remain constantly at work will cause you to lose power.” Warren Wiersbe adds, “The ability to calm your soul and wait before God is one of the most difficult things in the Christian life. Our old nature is restless…the world around us is frantically in a hurry. But a restless heart usually leads to a reckless life.” Rest restores us, enables us to think more clearly, rescues us from reckless living, and gives us space to draw closer to God. I understand the importance of worship. Chuck Swindoll remarks, “What comes from the Lord because it is impossible for humans to manufacture it? Wisdom. What comes from humans because it is impossible for the Lord to experience it? Worry. And what is it that brings wisdom and dispels worry? Worship.” Committing a day each week to worshiping God is vital in moving our souls from worry to wisdom. I understand the importance of saving time for family. Zig Ziglar writes, “My friend and colleague, Sheila Murray Bethel, points out that she has never heard a man say at the end of his career, ‘If I had it to do over I’d get up earlier and go down to the corporation and get on with my career. I’d stay later and work harder.’ She has heard, and so have I, many men say, ‘If I had to do it over, I’d spend more time with my family. I’d get to know my kids better. I’d court my wife more.’” Saving a day for family is one of the richest investments of our time and life. I understand the importance of Sabbath, so why don’t I practice it more faithfully? That’s my problem with Sabbath. I live as though I am Creator instead of created. I lie to myself and say that I ought to be able to do all things and be all places. My problem with Sabbath-keeping is that I do not admit to myself that my own strength and energy are limited and that I am subject to the need for rest and replenishment. I love the report in the Gospels about John the Baptist sending his disciples to Jesus to ask, “Are you the one who was to come, or should we expect someone else?” (Luke 7:19) I love seeing that even John the Baptist had as much trouble recognizing Jesus as I do sometimes. The truth is that I expect God to show up in certain ways and to do certain things, but He does not subject Himself to my expectations. He acts independently of what I expect. John had expected Jesus to come as a conquering hero, throwing out the Romans, trampling the sinners, establishing a righteous earthly kingdom. But Jesus surprised John by coming as a Servant and befriending sinners and moving slowly and patiently toward dying for our sins. It’s not what John had expected, but it was the wonderful way God was working! Likewise, I expect God to bless me and those whom I love with pleasant lives where the important things in life turn out well. But God doesn’t always fulfill that expectation (and hope) of mine. I go through tough times, and I expect God to jump into my mess and rescue me from all my problems, but God often chooses to leave me in those problems for a while to build strength and patience and understanding and character in me. Christ doesn’t show up in the ways I expect, but, as John the Baptist found out, He does show up in the way that is best. In my own life, time and time again I have discovered God working for good in ways I had not expected. “The instrument that tells you that you’re guilty is usually called the conscience. It communicates through your emotions and warns you when there is a problem in your life. It is very much like your body’s pain-sensing system…. When you cut your finger, the cut, dripping blood, is an indisputable fact. Anyone can see that it needs attention. But the pain that comes with the cut makes it urgent. I appreciate that perspective…but it leaves me with a question: If the remedy for a cut finger is a Band-Aid or a few stitches, what is the proper remedy for guilt? What needs to be done to set right the wrongs we have done? Ignore it. This certainly seems to work for some people. But actually, the people I know who use this strategy effectively are people whose consciences have become so calloused or so dead that they have stopped feeling for others and have stopped caring about what pain their wrongs do to themselves or to others. Fix it yourself. This seems to be the strategy used by most people. We try to make up for our wrongs by doing enough good things to weight the scale on the side of our goodness rather than on the side of our badness. But where does this leave us? It leaves us under constant pressure to do enough good deeds to make up for our faults and failures, or to hide enough of our wrongs and struggles so as to fool ourselves or others into thinking we are better than we really are. Either way, we are left with an impossible task. No matter how hard we try to do good and to cover up our wrongs and our struggles, we cannot fix it ourselves. Be forgiven. The Bible teaches that God did something about sin that I could not do. The best I could hope for is to do enough good things to outweigh my wrongs. But the Bible teaches that when Jesus died on the cross He didn’t just do a good enough deed to outweigh the bad things I have done over the years. The Bible teaches that on the cross Jesus actually took our sins upon Himself. Sin destroys life. Sin kills. 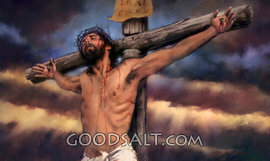 Because Jesus took our sins upon Himself, our sins killed Him. But in taking our sins and by dying from them, His death took our sin away from us. The remedy for the pain of guilt is not to ignore it or to try to fix it ourselves. The remedy is Jesus’ forgiveness. In Jesus’ death, sin and guilt and judgment were overcome by that which is greater than them. Sin and guilt and judgment were overcome by the immense love of God. Forgiveness is the only real remedy to the pain of guilt. JESUS’ DEATH TURNS IT ALL AROUND! Without Christ dying for me, I would be doomed! A shame-based identity believes that when I fail, I am a failure. When I make a mistake, I am a mistake. A shame-based identity believes that the way for me to grow stronger in my spiritual life has to do with trying harder to be good and suppressing anything in me that seems to be contrary to what a good Christian should be. A shame-based identity pushes me to hide from myself and from others my faults and failures. This shame-based identity leads me to Pharisaism not to intimacy with God. It keeps me in the company of the older brother in the story of the prodigal son—working dutifully in the Father’s fields but missing out on enjoying the grace of the Father. Without Christ dying for me, I would be doomed to remain in this shame-based identity. In a shame-based identity, it is up to me to earn my worth; it is up to me to live up to everything that a good Christian should be. If I don’t, I am a failure as a Christian. But Jesus claims that it is He who came to fulfill the Law. He did it by turning around the means by which a person is set right with God. In a shame-based identity, the pressure is on me to do everything that is necessary to set myself right with God. But the gospel declares that at the cross Jesus took our sins upon Himself and died for us to take away everything that separates us from God. That’s how He fulfilled the Law. Apart from Jesus’ death for us, the only way we could hope to be set right with God is by fulfilling the Law ourselves, which we cannot do, so we are left perennially in the failure and despair of a shame-based identity. It is only in taking seriously what Jesus did on the cross that I can step away from a shame-based identity and live in the joy and peace of God’s grace. When I take seriously Christ’s death for me, the pressure to be good slips off my shoulders. When I take seriously Christ’s death for me, I can move from the guilt and despair of a shame-based identity to the gratitude and hope of a grace-based identity. Thank God that Jesus came to fulfill the Law and the Prophets!